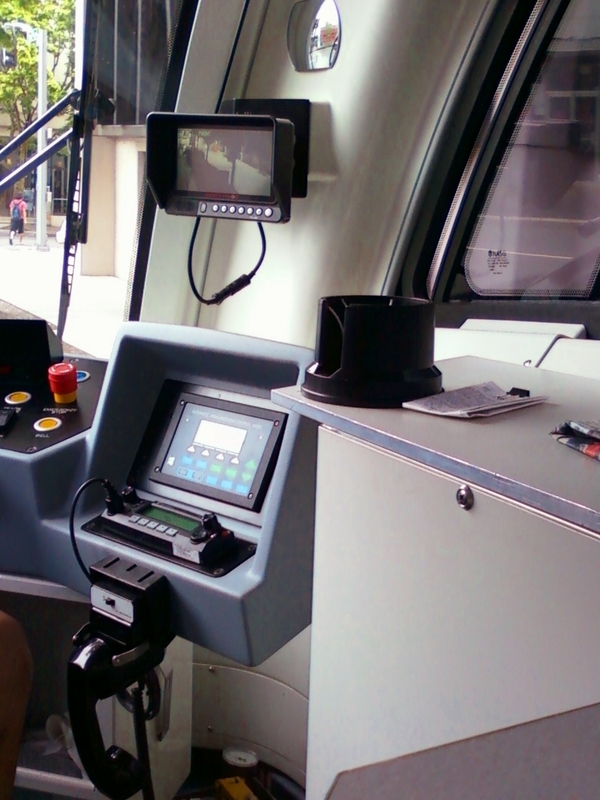 The Type 4s are the newest cars in the fleet, having entered passenger service in August 2009. These are very different from the Type 1, 2, and 3 cars! 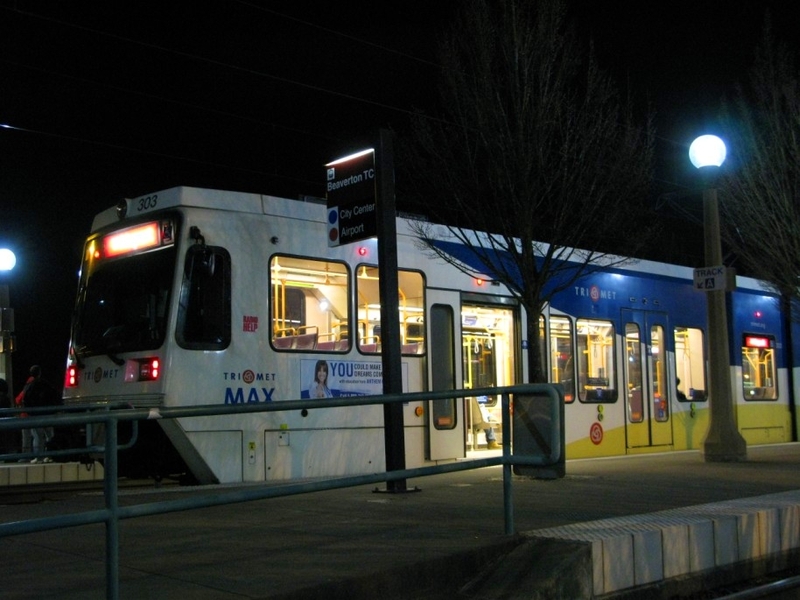 Color-wise, they all have the new TriMet color scheme, and like the Type 3s, external ads are limited to a small part of the outer body (typically the ads I’ve seen on the 4s are TriMet specific ads, such as promoting the WES service). The Type 4s use LED displays for the destination signs (compared to the scrolling signs of the older trains). 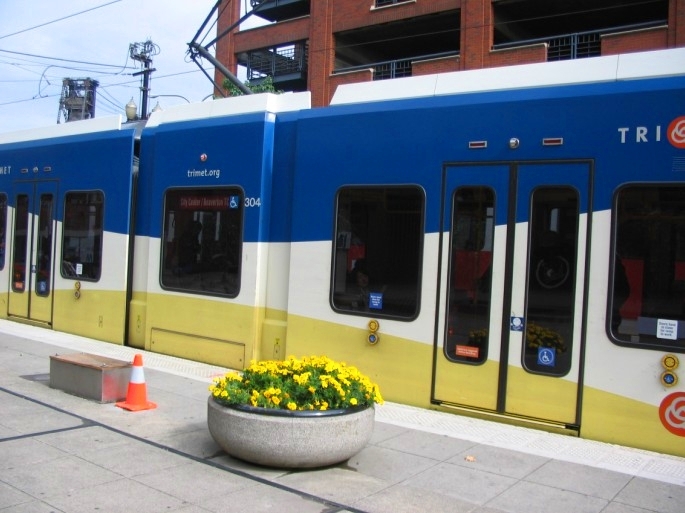 These are manufactured by Siemens and were first put into service in 2009 to coincide with the Green Line alignment opening. Because each Type 4 car has only one cab, they will only ever be coupled with another Type 4 and you won’t see a single car Type 4 train. Each type 4 has a folding coupler head located under the cab that permits it to be coupled to a Type 1, 2, or 3, but that is only ever used if the Type 4 train needs to be towed or pushed somewhere while out of service – it will never be coupled to one of the older fleet in service. 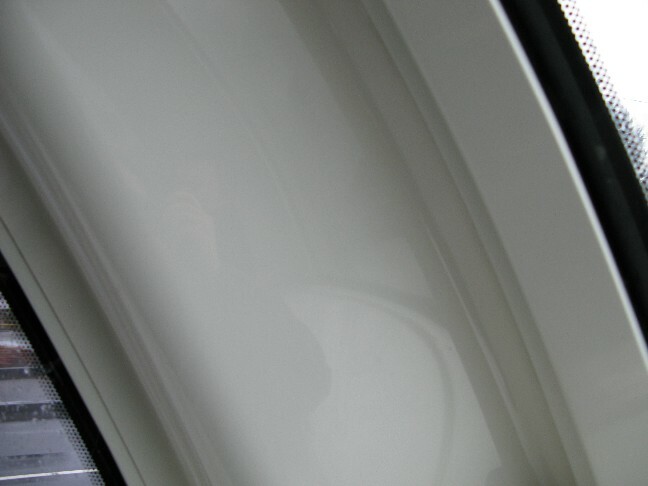 The layout inside is also changed from the older cars. 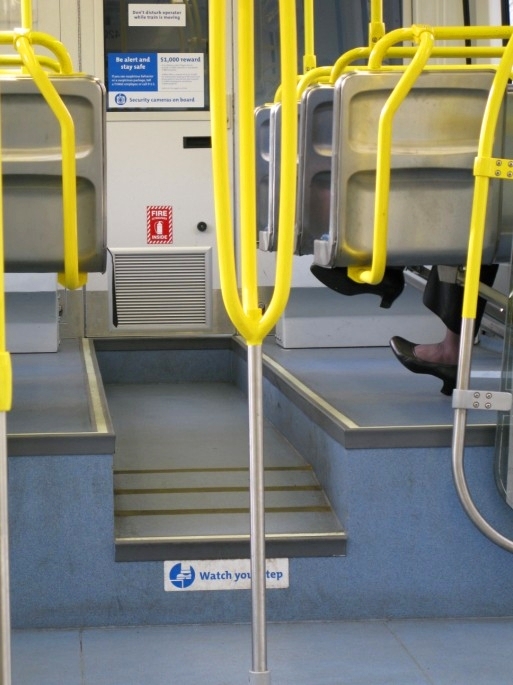 Similar to the Type 2s and 3s, there is an upper deck near the cab, behind which are bike racks and then a priority seating area for people with mobility devices or other physical impairments. 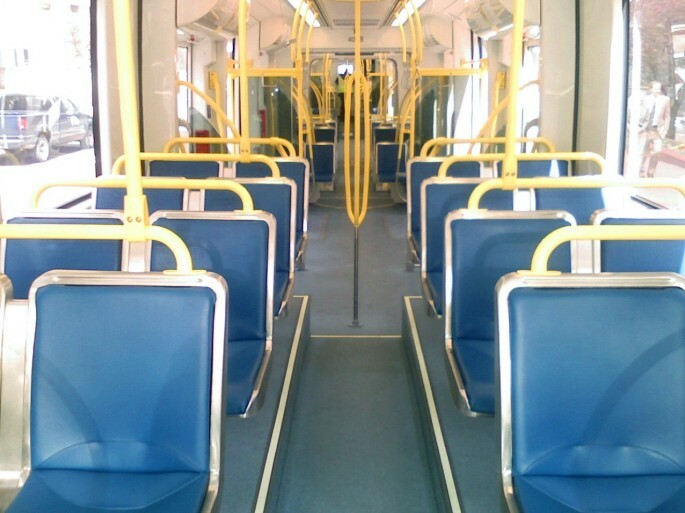 Then the C-Section (the middle part) of the train has seats arranged face-to-face, somewhat similar to the seating arrangement in a Type 1 and different from the sideways-facing seats in the C-Section of the Type 2s and 3s. 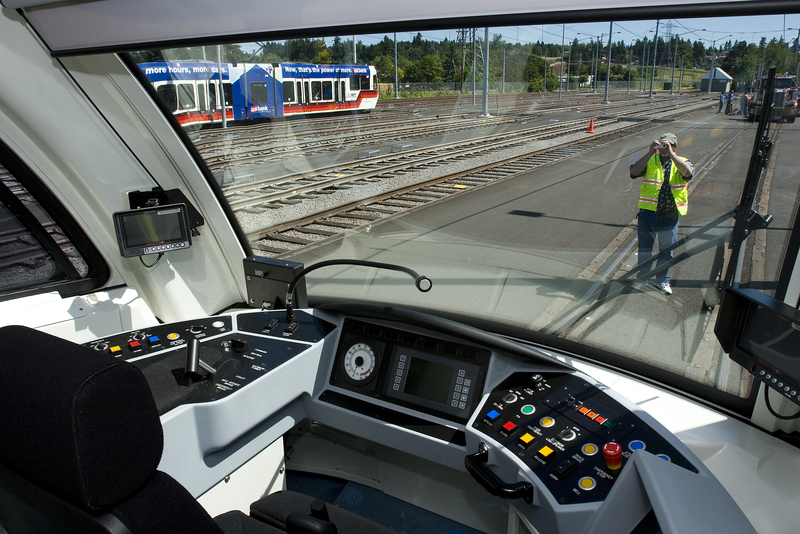 Then in the back of the car is the “parlor” – this is where the second cab of the train should be, but instead there is additional seating and big windows like the windshields of the cabs. Even though the 4s are shiny and new and I think they are impressive looking, I’m not really a fan of them on a practical design level. Some seats are very cramped: Good luck comfortably fitting two full-grown adults in there! 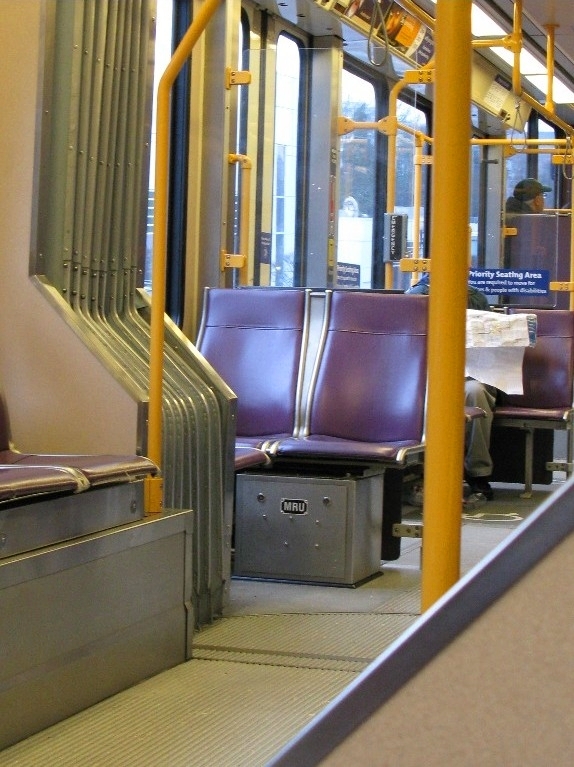 There are a lot of tripping hazards: I’ve seen people trip on that ledge on either side of the aisle between the seats, especially when the train is crowded. 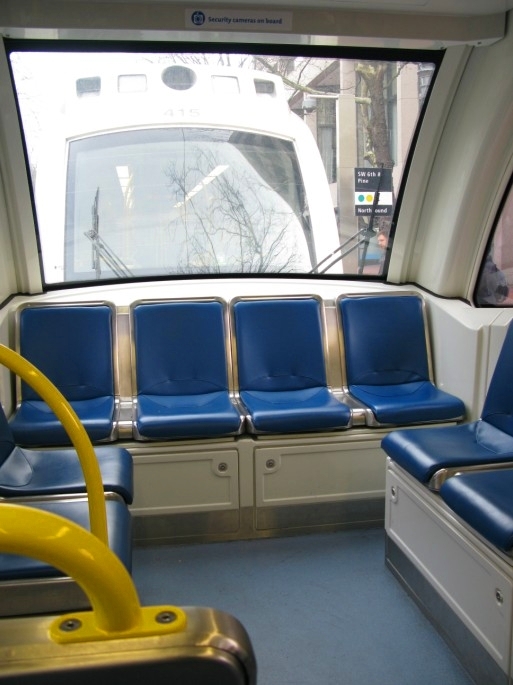 In the older fleet, there is no step between the aisle and the seating. Also, though it’s a bit hard to see in the photo above, that aisle slopes down at the end towards the center of the train, which catches a lot of people off guard making them stumble. The above picture was taken before the 4s were put into service – yellow tape was placed on the floors around the tripping hazards, which was great for the first week or so. But now that tape is sort of a muddy brown-grey color, so it’s not really effective to draw people’s attention to changes in the floor. 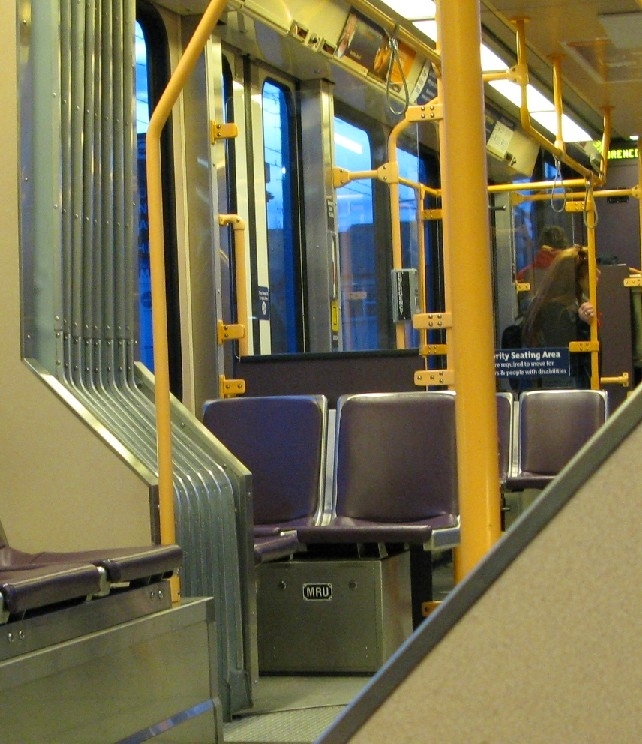 View of the aisle at the front of the train car showing the sloped tripping hazard and the once-yellow striping. This is the priority seating area for seniors, people with disabilities, and mobility devices, where all of the overhead bars are out of reach of shorter people so it’s a lot of empty space that can be difficult to stand in if the train is crowded. 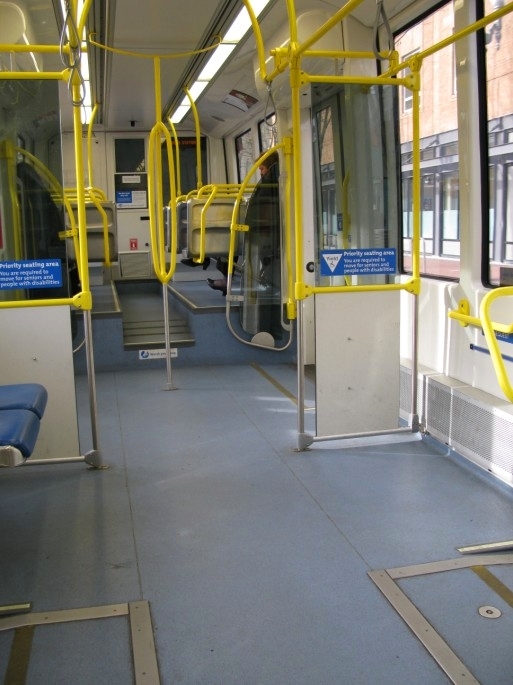 I understand that there are no floor-to-ceiling stanchion poles here to allow wheelchair movement, but I prefer the design of the priority seating area from the Type 2s and 3s. Those have three sets of fold-down seating in this space and wider partitions separating this area from the bike rack where there is room for two people to easily stand or hold on. Here there is only one set of fold-down seating because the bike rack partitions are narrower, leaving room for only one person to stand there. I would have assumed that the priority seating area for seniors and people with difficulty navigating steps would have more… well, actual seating. I think this space could be better served by adding more fold-down seating that can be used as needed and folded to allow for wheelchair boarding. 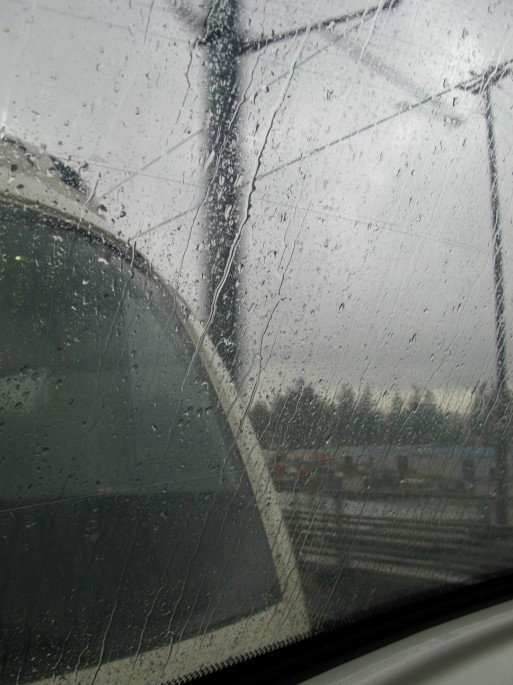 I think the giant blind spots which are much larger than the ones in the other train car types are a safety hazard. 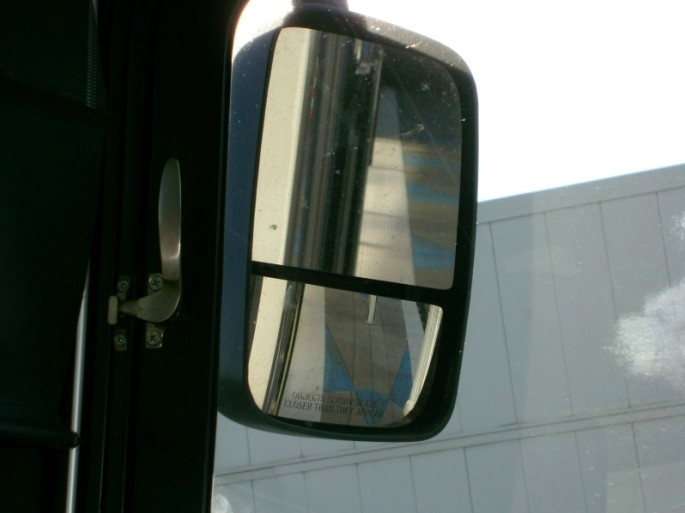 The above picture isn’t a Type 4 camera monitor, but it’s a good illustration why I don’t like relying on camera monitors alone – if your mirror gets gunked up, you can reach out and clean it. 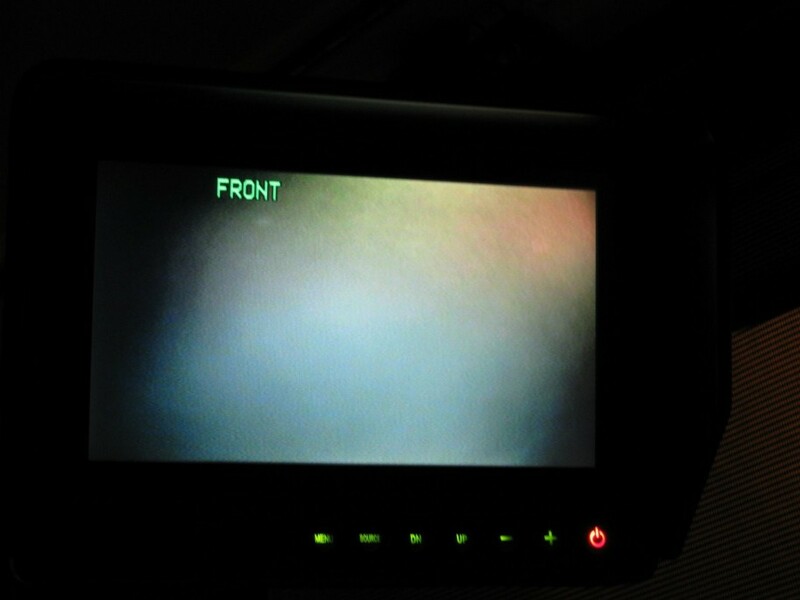 If your camera ices over like this one did during freezing fog, you lose the ability to watch that side of your train unless you also have a mirror to use. 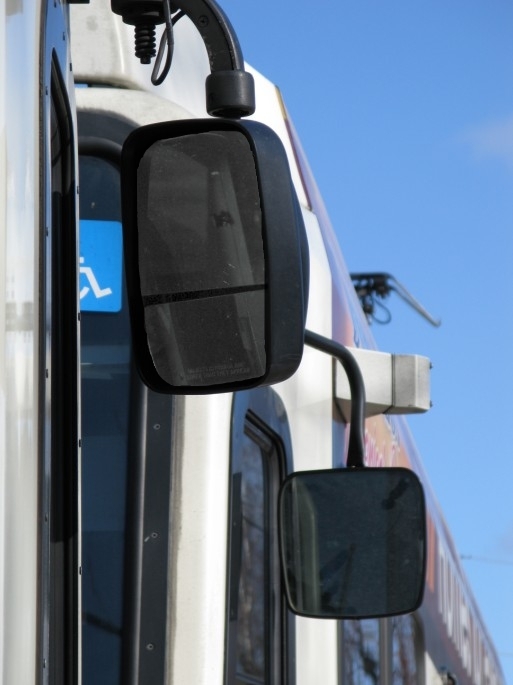 Granted, mirror visibility isn’t as critical in trains as it is for buses (since you’re not exactly going to be changing lanes with a train) but you still need to be able to see down the length of the platform to watch people boarding and exiting your train. Seeing out the front! Little kids seem to really enjoy this. So do some adults. 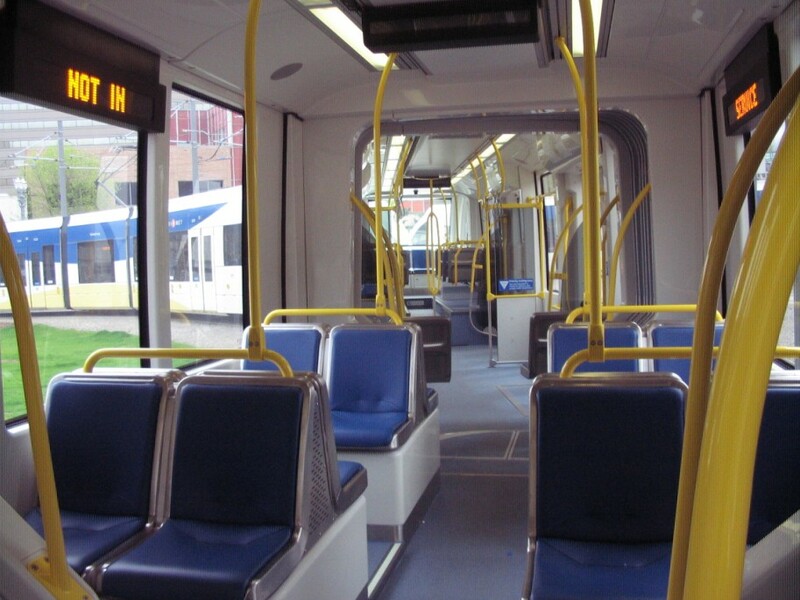 And the ride quality of these is extremely smooth, thanks to the ability of these trains to be set at a speed and automatically maintain it – reducing the jerkiness around curves or down hills that can sometimes be felt with the older trains in the fleet. That about wraps up the main points of the four train car types. 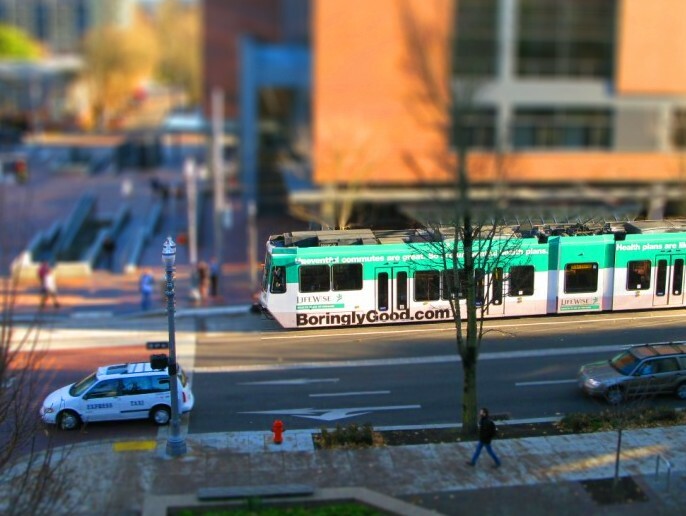 Nowadays most MAX trains will be two cars long (one exception is the Portland Mall shuttle, which will be a single Type 2 or 3 car that runs between PSU and Union Station during the day on weekdays), with a Type 4 always coupled with another Type 4, and a Type 1 (high floor) always coupled with a 2 or a 3 (low floor). 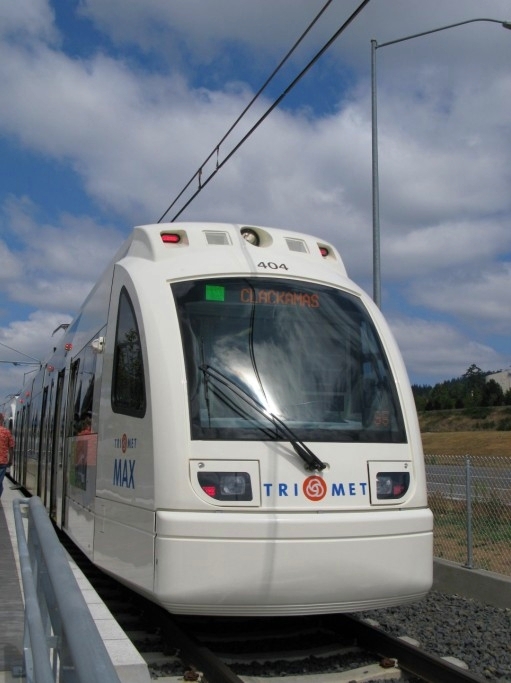 The cars are capable of functioning as train longer than two cars, but that will only happen in unusual circumstances, such as coupling a two-car train to another two-car train that is stuck or broken down in order to move it – which happened in June of 2010. 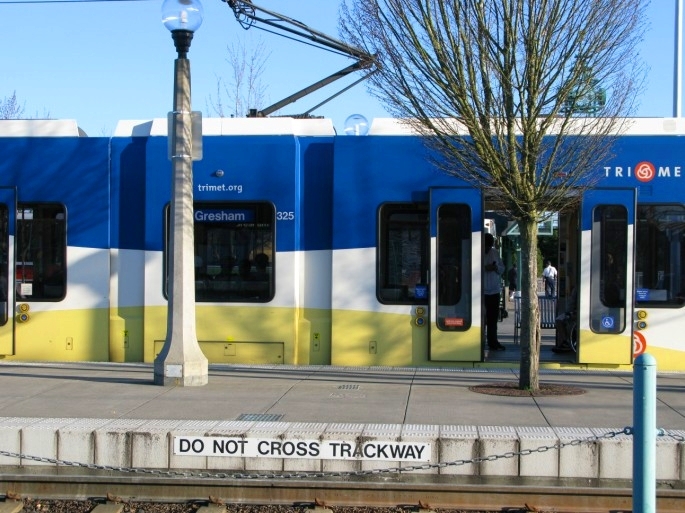 The short length of Portland city blocks prohibits trains in normal service being longer than two cars – a three-car or longer train would block the intersection behind it at a platform stop. In future entries I may go into specific detail about something particular to one car type or another, but this series of entries serves as a reference point giving an overview of the four types of train cars used in service today. I suppose this can be considered parts 2 and 3, as the Type 2 and Type 3 rail cars are very similar. As far as passengers are concerned, the differences are cosmetic, so for that reason, both types of cars are described together below. There are more of these than any other in the fleet – 52 altogether. 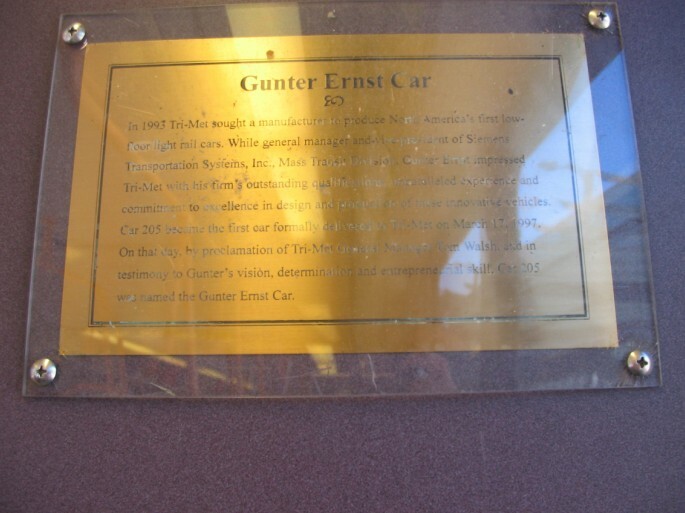 These were the first low-floor cars in the US, manufactured by Siemens and delivered to coincide with the opening of the westside alignment, with Car 205 (designated the Gunter Ernst car) being the first that was delivered. 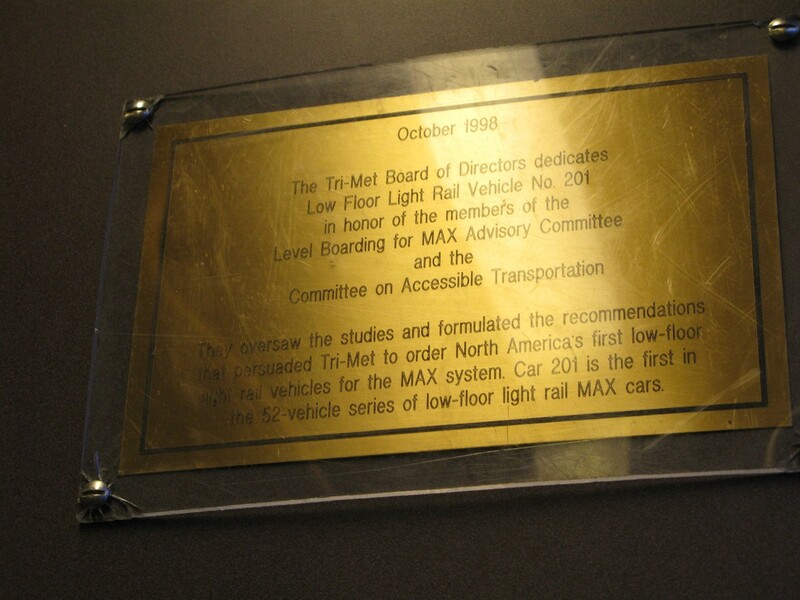 Car 201 has a dedication plaque as well for the Level Boarding Advisory Committee and the Committee on Accessible Transportation. 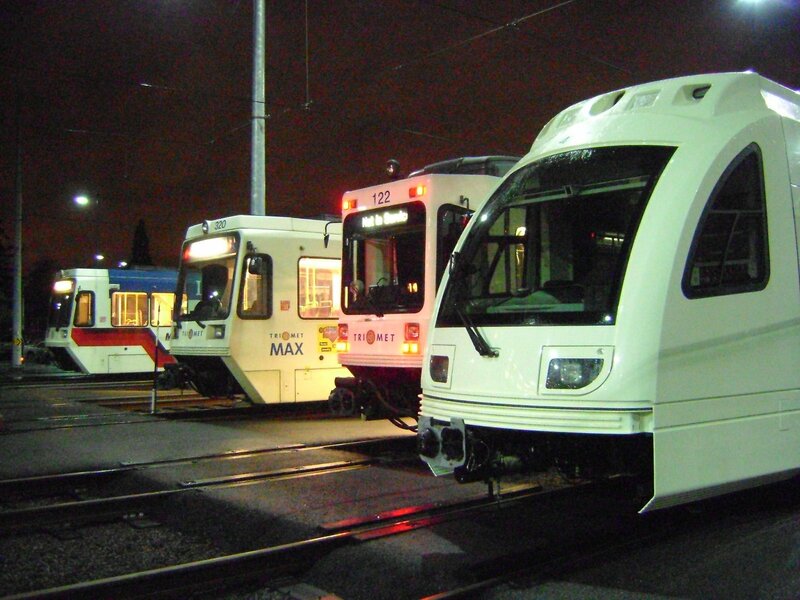 Each Type 2 car has two cabs, one in each end, and they are sometimes used in service as a single-car train. 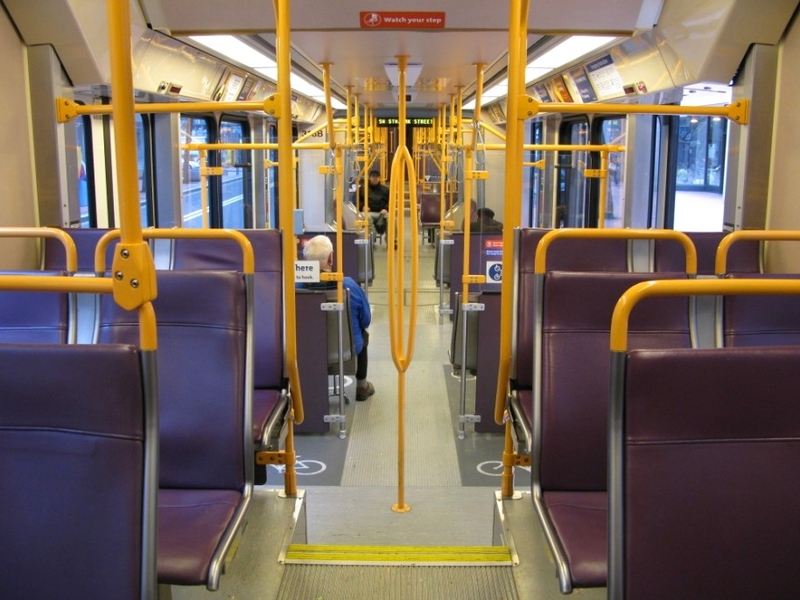 They have a raised upper deck by each of the cabs, and the sideways-facing seats in the middle of the train (called the C-section, though it has nothing to do with babies) are slightly higher, presumably to have room for the wheels, brakes, and sanding tubes underneath. 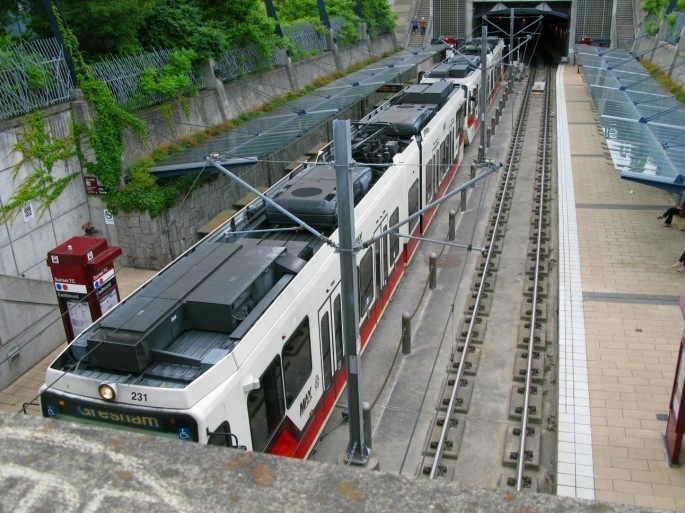 Unlike the Type 1s which have a lot going on (mechanically speaking) underneath the train, the Type 2s moved basically anything that isn’t related to the wheels, brakes, or sanders to the roof of the train so that the floor of the train is on platform level. 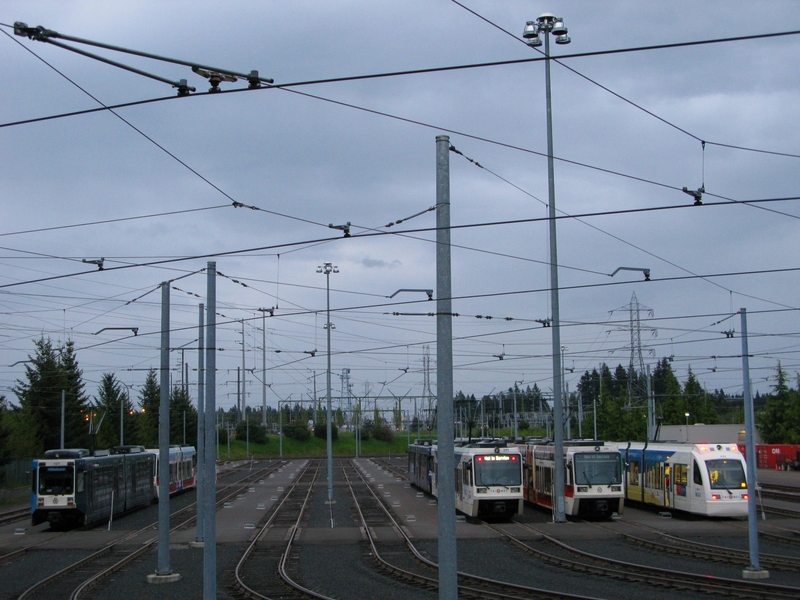 Also manufactured by Siemens, these were introduced in 2003 to coincide with the opening of the Yellow Line alignment. 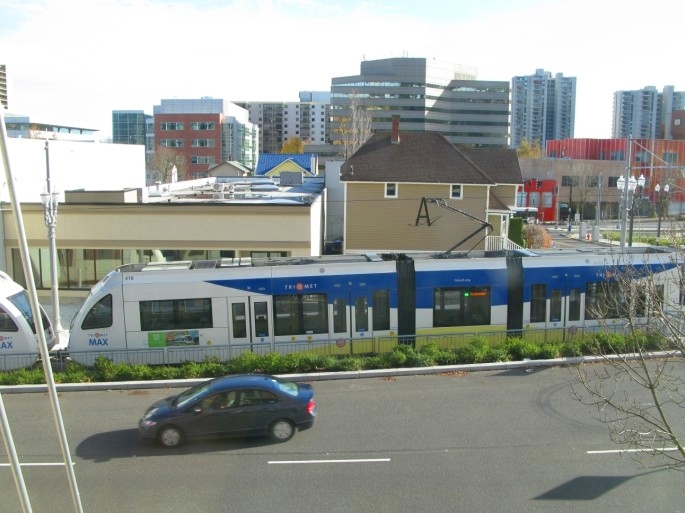 Structure-wise, these low-floor cars look almost identical to the Type 2 cars, but will always have the new TriMet color scheme (whereas only one of the Type 2s does), and advertisements are limited to a small part of the outer design. 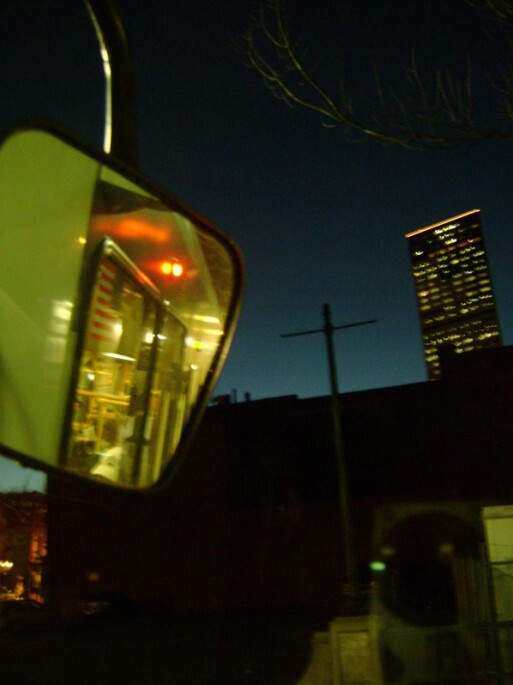 Type 3 Exterior – Car 304 haunts me. I don’t know why, but I see/have been in this car more than any other. I’d be nearly convinced there was more than one 304 in the fleet if I didn’t know for certain otherwise. From a passenger’s standpoint, Type 3s are essentially identical to the Type 2s. In the passenger area, the seat backs are higher in a Type 3 than in a Type 2 but the layout is the same. I can think of one other very minor difference that you’ll see in a Type 3 that isn’t in a Type 2 but it’s nothing passengers will ever need to concern themselves with, so basically you can consider the passenger interiors identical. Can you spot the difference, not counting the height of the seat backs? Told you it was irrelevant to passengers! It has to do with the brakes. Up next, the new Type 4s!